1. The race day crowd at the Sebring International Raceway was judged to be up this year – making it the biggest ever 12-hour throng after a decade of growth under the aegis of track owner/American Le Mans Series founder Don Panoz. …This follows by a matter of weeks the Rolex 24 at Daytona, which also had a record crowd due to the development of the Grand-Am series. …All of this not long after the Great Recession. 2. 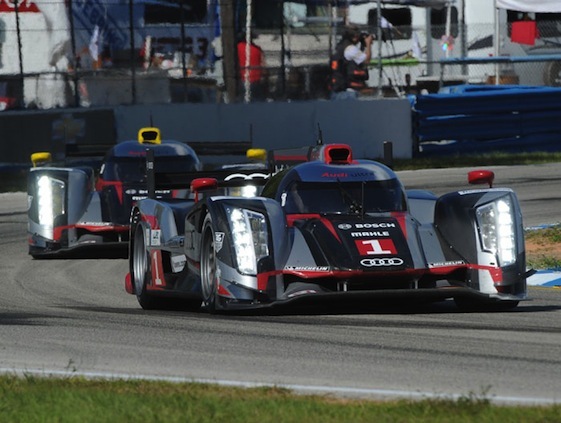 Audi drivers Allan McNish, Tom Kristenen and Dindo Capello are acknowledged to have been the best trio in endurance racing over the last decade. 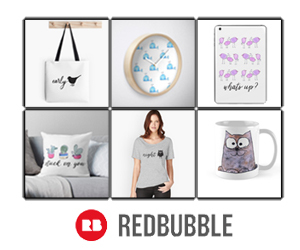 But which one is the best? Most would choose McNish for his incredible aggressiveness behind the wheel or Kristensen for his eight wins at Le Mans in three different makes (Porsche, Audi and Bentley). 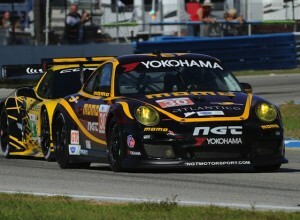 Porsche has winning tradition at Sebring. manufacturer will be entering a hybrid prototype for the first time …That’s three years after Formula 1 integrated the KERS into its cars, which has become a standard feature. In other words, by time the rule makers at the ACO in Le Mans, France got around to integrating hybrid technology, the opportunity for sports car racing to be THE technology leader has left the building. …Adding insult to injury, Peugeot left endurance racing’s top echelon before ever racing its hybrid model. …Bruno Famin, technical director for Peugeot’s racing department, was among those in the paddock at Sebring. Bruno was “scoping,” he said. …Peugeot pulled the plug on endurance racing in part because of concerns about a backlash from union workers after the closing of some of its manufacturing facilities in France. 4. Jean Todt, formerly with Peugeot in the world rally and endurance racing, then with Ferrari in F1 and now with the FIA as its president, made his second U.S. appearance in his current capacity. Much to the surprise of those hosting him at Sebring, perhaps, Todt declared the ALMS to be a feeder series to the World Endurance Championship. …This comes after the ALMS helped save the Le Mans 24 hour by providing entries via Sebring and the Petit Le Mans, which in turn helped save sports prototype racing, which in turn the FIA has glommed onto in order to revive a world endurance racing championship. …“Now the ALMS teams are in position to move up to the WEC,” explained Todt. …Back in the 1970’s, the FIA wouldn’t allow drivers with FIA licenses to participate in endurance races in the U.S. unless the race was a WEC-sanctioned event. …Some attitudes, it seems, never change. 5. Porsche , which has previously announced a new LMP1 car will be ready for the 2014 season. But according to informed sources, the work on the car has been stopped. The reason? The German manufacturer’s racing officials have been told by the ACO that the rules being used by Toyota in the design of its new TS030 Hybrid may not be part of the rulebook revision for 2014. That’s the year the ACO has plotted for finishing (finally) its hybrid rules. …And I guess this confirms what everybody already knows: Porsche’s next Le Mans prototype contender will be a hybrid. …Audi will not wait. Its new hybrid will be testing Monday at Sebring, using a flywheel system with energy recovered from the front brakes. It’s expected to race as a fourth entry at Le Mans. 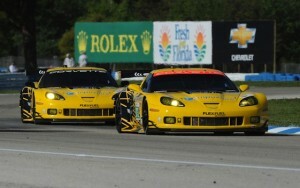 Corvette has big history at Sebring. Wing in “garage 56” (meaning it’s been granted a special opportunity to race as an exhibition vehicle). Panoz envisions the Delta Wing as able to compete in the LMP1, LMP2 and LMPC. The radical new car with a narrow nose and tail rudder “has to be through a logical process to not ruin the investment of people who already have cars (racing),” said Panoz. …Since Panoz is the owner of the ALMS, it seems more than likely that the Delta Wing will be eligible to run for points in the series next year with Highcroft Racing under Nissan power. …The Delta Wing is the anti-hybrid, i.e. the weight savings are designed to generate less tire wear and fuel consumption from a conventional engine. 7. A betting man would have a hard time choosing between Sebring and NASCAR at Bristol when it comes to the number of high-speed accidents – or cars involved. Could that be the tie that binds so many racing fans to these events? …An over/under on total accidents between Saturday at Sebring and Sunday at Bristol would be interesting. 8. In the helter skelter of the media center, somebody has purloined my carefully compiled hourly reports and Pit Notes. It matters not. The race doesn’t begin until sunset, about three hourse from now, when the temperatures drop, engines gain more power, tires gain more grip, speeds increase, dusk and poor visibility arrives, tired drivers get closer to winning at Sebring (!) and all hell breaks loose. 9. Although the old bomber hangars have been torn down, history is omnipresent at America’s oldest sports car endurance race. How many 60-year-old tracks, after all, have the original (concrete) pavement still in place? 10. This writer’s first Sebring occurred just shy of his personal 30th anniversary mark. …That means he’s now closing in on his 60th anniversary as well. …Where did the time go? It went racing, a lot of it. …Regards and no regrets.